Last week I posted about a short hike I took to see two gorgeous waterfalls on Butte Creek. 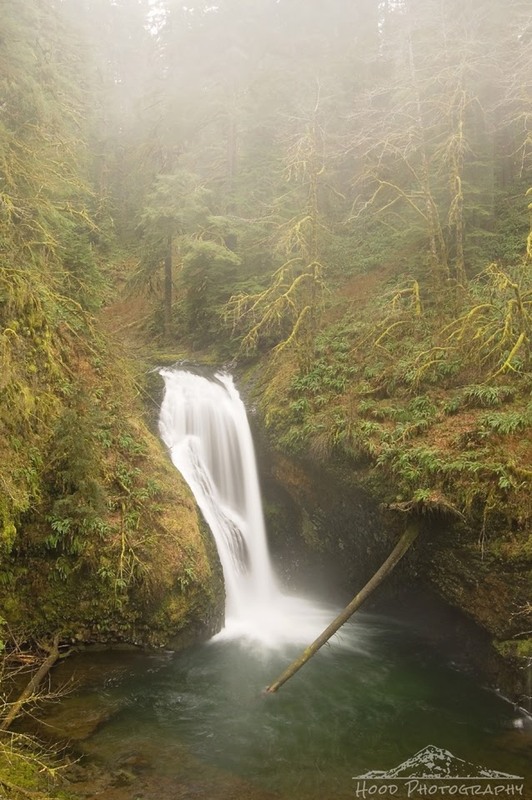 This is Butte Creek Falls (AKA Lower Butte Creek Falls). To access this view we went just beyond the end of the maintained trail to a rocky cliffs edge that towered over the creek hundreds of feet below. I set up my tripod on this precarious ledge and shot the twisting waters of the waterfall crashing down through the foggy forest. Beautiful photo - wonderfully edited. Stunning! I just love the cloud like waterfall. I really like water-falls, this is a very nice shot. It's been so long since I visited one, would really like to go to one again in the near future. That is really beautiful. You've captured it all perfectly. Gorgeous photo! Beautiful, magical falls! I am always in awe of waterfalls. Thanks for linking up last week - catching up because I had no wifi on holidays and at a paddling regatta. Oh my, what a beautiful photo! I can almost feel the spray and mist and hear the water flowing. That's so beautiful. Looking through a lot of your posts I can only say what a wonderful part of the world you live in.